Update: This deal has now finished and the price has now surged up to £241.45 on Amazon's website. If you're still desperate to buy the watch, we've found it for £229 at Chain Reaction Cycles but that's nowhere near as cheap as Amazon had it on April 8. 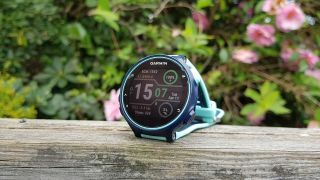 Original story: The Garmin Forerunner 735XT did fantastically well in our review with it scoring 4.5 stars, and today you can get it for dirt cheap if you buy it through Amazon. As part of the retailer's big spring sale, the Forerunner 735XT is down to the lowest price we've seen at £169.99. Originally on sale for £299.99 we've often seen the price drop to around £229, so considering this is around £60 less it's quite a substantial discount on top of what we've already seen it drop to. You've got the choice of black or mint, and if you have Amazon Prime you'll be able to get it delivered as soon as April 9.